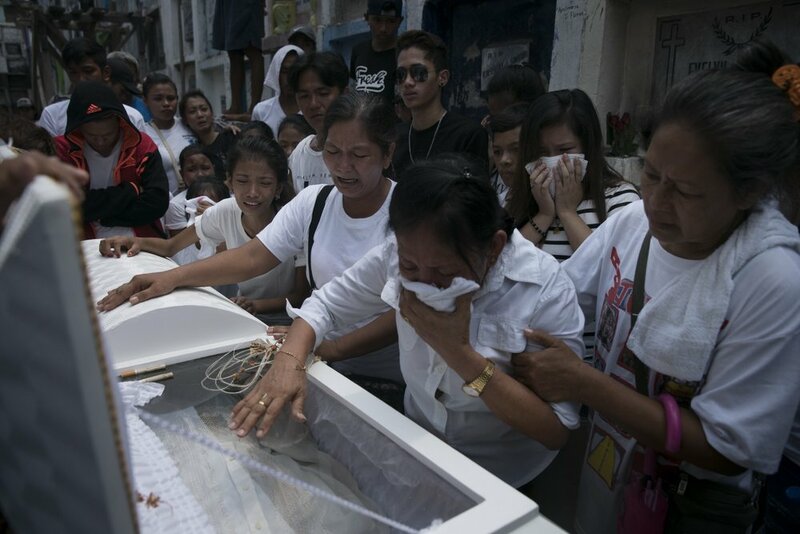 Philippine police forces have killed thousands in a brutal crackdown on suspected drug dealers and users — a campaign that President Trump has praised. On the eve of Trump’s visit to the country, documentarian Ed Ou tells us what life is like on the ground. When Philippine president Rodrigo Duterte came to power in June 2016, he immediately declared a “war on drugs,” ordering a dedicated police force to carry out a massive crackdown that has resulted in the arrests, surrenders and deaths of suspected drug users and dealers. So far, human rights groups estimate that the campaign has claimed the lives of 7,000 to 12,000 Filipinos, most of them from Manila’s poorest neighborhoods. It remains to be seen whether Duterte’s recent cease-fire will hold. On the eve of President Trump’s visit to the Philippines today, we asked Ou and his co-author Aurora Almendral to what exactly the situation on the ground looks like, and how it compares to the war on drugs in the United States. While the Philippines does have a real drug problem, its severity appears to be exaggerated, especially when you consider usage in other countries. According to United Nations data, The Philippines has the highest use rates in Southeast Asia for meth (which is locally called shabu). But, say Almendral and Ou, overall drug use rates — defined in the Philippines as the number of people who have used any type of recreational drug, including marijuana, within a year — is about 1.8 million, or less than 2 percent of the population, according to a 2015 survey by the Philippine government’s Dangerous Drugs Board. Compare this to US overall drug use rate, which is about 10 percent. When Duterte took power, Almendral and Ou say, he estimated the number of drug addicts first at 3 million, then at 4 million. Critics say the number is inflated, and in an interview with Reuters, the chief of the Philippine Drug Enforcement Agency said Duterte “just exaggerates it so we will know the problem is very big.” In May 2017, Duterte fired the head of the Dangerous Drug Board for contradicting his estimate. Then, in September 2017, Alan Peter Cayetano, the Foreign Affairs Secretary and a close Duterte ally, estimated the number of drug users in the Philippines to be 7 million, a significant spike from just a few months earlier. From June 2016, when Duterte assumed office, until October 2017, the Philippine National Police ran the bloody anti-drug campaign. How the government had targeted drug users and dealers: people on watchlists drawn up by local officials were monitored by beat police officers, CCTV, and special police units dedicated to drug enforcement. According to the police, the drug enforcement units — plainclothes officers unknown to the community — conducted surveillance, gathered intelligence and built cases before they carry out a police operation. These units usually say that suspects were killed during police operations because they fight back, and so they are killed in self-defense. Kosa Bulaclac, the father killed in this documentary, did use drugs, say Almendral and Ou. His family and friends say that undercover policemen and district officials had been monitoring him on the ground and on CCTV. The police say he was killed because he fought back, but, as can be seen in the film, there were ligature marks on his wrists, and according to witnesses, he was already in a van in police custody when he was killed. One witness told the family that they saw the police shoot him as he begged for his life. According to a recent survey, 54 percent of Filipinos doubt that suspects killed by police fight back. Witnesses and human rights organizations regularly accuse police of planting evidence — guns, drugs and cash — on a suspect, say Almendral and Ou. “As shown in the film, some suspects show up at the morgue with welts on their wrists that appear to be ligature marks — or gunshot wounds on their forearms which suggest the suspect was shielding himself at the time he was shot.” In addition, the police operate under the legal concept of presumption of regularity, and with little oversight. Only the most egregious cases of police abuse are thoroughly investigated.